Note: While cleaning out my garage recently I came across this little paper which was written when I was a senior in high school. Since this covers a subject that is rarely discussed in American history classes today, I thought I would put it online just to share the information. Please overlook some of the puerile writing ... it was written in 1971 when I was only 17 years old. The journey to America began in Spain in the year 1492. That was the year that marked the climax in a series of anti-Semitic laws passed under the rule of Ferdinand and Isabella to rid the Iberian Peninsula of its Jewish inhabitants. For centuries the Jews had enjoyed a particular freedom in Spain that had not been theirs in other parts of the world. As always, there had been persecutions in Iberia, but by comparison Spain offered a relatively safe haven for Jews suffering brutally in other countries. It had always been that way. Jews were allowed to take up residence within a kingdom — segregated, of course — and to become the primary financial resource for the king. They were always among the monarch's most faithful and loyal subjects, but they were never his most trusted. Perhaps it was because of their great loyalty that the Christians looked upon them with both awe and suspicion. But when the monarch’s friendship with the Jews became too conspicuous, when the court became too full of these “strange little men,” he would have to regain his standing with his own people and as likely as not would endorse a campaign against the very people who had so long supported him. The Jews would be persecuted, their goods taken, a few martyred, and others expelled from the kingdom. What was it that made the expulsion from Spain more a part of the history of early American Jews than any other event in Europe at the time? To answer this, one must first examine the conditions of the Edict of Expulsion. The Jews were ordered to leave Spain no later than August 1, 1492 (though in the event the last groups did not leave until the following day, August 2). Perhaps it was indeed some twist of fate that August 2, 1492, was also Tisha B’Av (Ninth of Av), the fast day that recalls the destruction of the First and Second Temples. (2) It was also the same day on which three tiny vessels sailed forth from their harbor near Seville and passed some of the very ships on which many of the exiled Jews had embarked. (3) Those three vessels were the small but notable fleet of Christopher Columbus on his way to a new world, a world of tolerance, and perhaps even a new Jerusalem. The reason the Jews came to the New World should be evident — they were fleeing the Inquisition. The first to come and live came as Marranos, a somewhat derogatory term for a converted Jew. (Many Jews became nominal converts to Christianity in order to escape persecution or death, but they retained their faith privately and remained Jewish in their hearts.) But even the converts often had difficulty finding acceptance aboard vessels sailing west. For this reason many tried to destroy every scrap of evidence that might show that they were or ever had been Jewish. On a September day in 1654, the barque Saint Catarina anchored in the port of New Amsterdam. (22) But to the dismay of all concerned, Captain de la Motthe forbade the Jews to take ashore even the few goods they had been able to bring with them until they had paid every penny of their fare. The Jews begged him to allow them to take their goods with them and reminded him of the other goods that were to be arriving soon from South America, but he would not budge. Finally, distraught, impoverished, and totally alone, the Jews disembarked and left their belongings behind. Since they had no money or any friends in New Amsterdam, they had to camp on the shore outside of town, exposed to the elements and the bitter northeastern autumn. (23) They had to live off bread from charity and grew disheartened at De la Motthe’s unceasing demands for payment. (24) They again asked the captain to be allowed to bring just a few of their goods and tools ashore so that they might start earning money to repay him; they asked him to be patient and wait for the other goods that had been left behind; they asked him to consider the amount they had already paid him and to trust them until he came again to New Amsterdam. But to all their pleas De la Motthe turned a deaf ear and remained unflagging in his prejudice. The Jews who remained, however, overcame these hardships, and on July 15 a special act was passed that gave them the privileges they had so long sought. (38) But even with the passing of this act the governor still refused to allow them to purchase real estate. When the British captured New Amsterdam from the Dutch in 1664 and renamed it New York, the position of the Jews remained unchanged for the most part. There is a record of at least one Jew coming from Newport and having difficulty setting up a retail trade in New York,(41) but by and large the Jews enjoyed a great deal of freedom under the British. A synagogue was erected on Mill Street in New York sometime between 1691 and 1695, and it was named Shearith Israel, meaning ”Remnant of Israel.“(45) And a remnant it was, for the story of Colonial Jews is not one of communities but of individuals. (46) Whereas Christians generally relocated to the Americas in large groups, there are no records of any European communities of Jews having immigrated to the New World during this period. 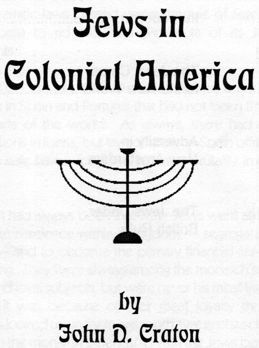 But for all their freedom in New York, there were few other Jewish settlements of any size in Colonial America. This was largely because most of the Jews came as individuals or in groups of one or two families rather than as communities. In fact, the original landing of twenty-seven Jews in 1654 constituted perhaps the largest single group during Colonial times. The Jews had come a long way since their expulsion from Spain in 1492. They had suffered much in every respect and were likely to suffer more. But at last they had found a home where they could practice their faith openly and without undue fear of governmental intervention. And of one thing all who knew them was sure — the Jews were here to stay. 1 Solomon Grayzel, A History of the Jews (Philadelphia: Jewish Publiication Society of America. 1968). Book II, chap. VIII, passim. 4 Max I. Dimont, Jews, God, and History (NY: Signet, 1962), p. 356. 8 Lee M. Friedman, Early American Jews (Cambridge: Harvard University Press, 1934), p. ix. 19 Peter Wiernik, History of the Jews in America (NY: Jewish Press Publishing Company, 1912), p. 62. 33 Wiernik, p. 62 ff. 41 ibid., p. 67 ff. 47 Wiernik, p. 67 ff. 49 Friedman, pp. 3-39, passim.